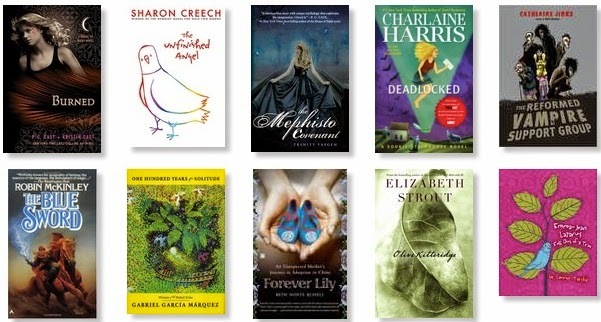 This week's topic from The Broke and the Bookish is: Top Ten Books that were Hard to Read. The penultimate book in the Sookie Stackhouse series had so little plot development, I kind of gave up finishing the series. This series of interconnected short stories about a bitter old woman was absolutely not my cup of tea. I do not care for magical realism! My friends like to joke that I like my magic systems to be realistic, but don't want my realism to be magical. I know! Shocker! This should be the kind of book I love. It came so highly recommended to me, I don't think it ever could have lived up to the hype. It just didn't feel magical enough for me. The main character was so painfully awkward. This was a tough one to slog through. I read this on the heels of reading several teen paranormal dysfunctional relationships parading as "romantic" and it was just too much for me to take. I love Sharon Creech! This book was so not her normal style though. The angel had such a disjointed way of speaking. I didn't care for it. Ugh. Depressed vampires didn't do it for me. This is where I ran out of steam for the House of Night series. The scenes where Zoey Redbird confronts her child self are just so very, very cringeworthy. Worst. Adoption. Book. Ever. Russell's racist dream sequences and highly unbelievable set of "coincidences" with her adopted Chinese daughter make for an excruciatingly embarrassing read.